It's a little hard to see with the black on black, but here's Phillip Lim's well known Tromp L'Oeil style in chic LBD form! It's currently on sale at La Garconne for $402 - only one size left! I had originally posted on the style back in November, check it out for a better contrast of the bust detailing. Hmm, this dress is a bit too close if you know what I mean, but it's certainly the look for less! Perfect for a cocktail event, the shiny silver fabric feels a little more holiday party than wedding to me, but either would work! 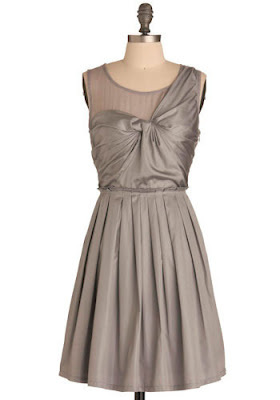 Buy at ModCloth for $100.